BPTF is a protein that helps regulate how DNA is bundled in cells and how genes are expressed. A team finds mammary stem cells depend on it to remain "immortal," suggesting a strategy for targeting breast cancer cells. When the researchers genetically removed or chemically inhibited the protein, called BPTF, stem cells could no longer maintain their “renewing” state and began to take on the character of specialized breast cells—and then soon died. Researchers have discovered that a chromatin-regulating protein called BPTF must be present for stem cells in the breast to perform their normal functions—maintaining a supply of stem cells and seeding the breast with specialized new cells when needed, for instance, during pregnancy. 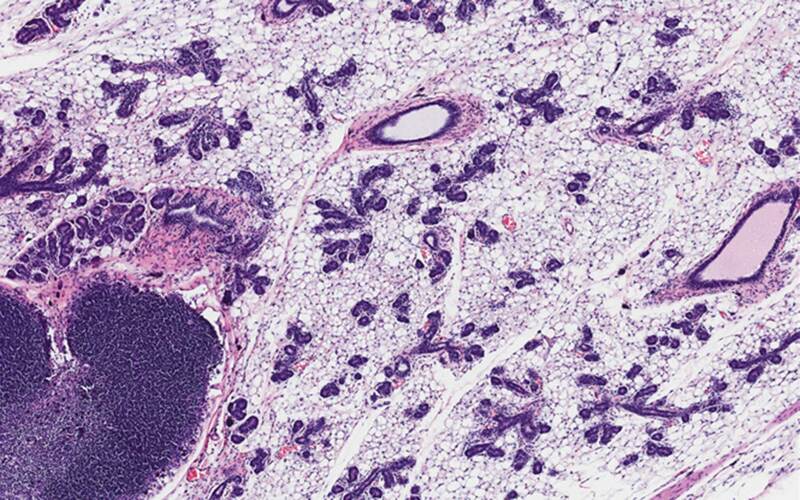 At the mouse equivalent of mid-pregnancy, there is normally (left side) a proliferation of milk ducts (the small purple structures in both images). When BPTF is knocked out in mouse mammary stem cells early in pregnancy, however, there is a drastic decline in the number ductal structures (right side). 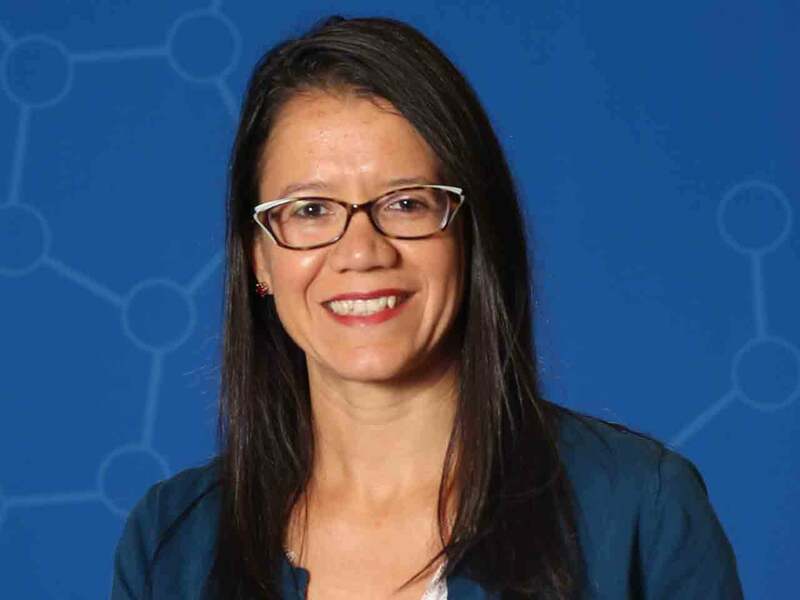 Dos Santos and colleagues suggests that knocking out BPTF in breast cancer cells could suppress or kill them. 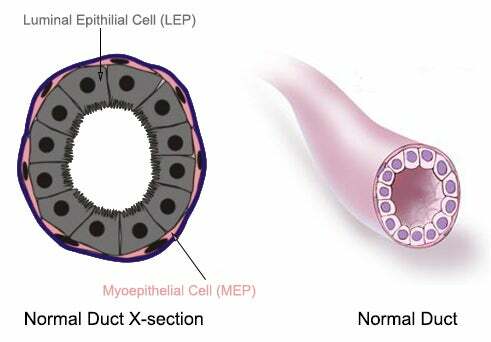 As the illustration below indicates, the hollow “tube” that forms the milk duct is built from luminal cells; these are surrounded by a thin layer of cells called myoepithelial cells. Receptors on the surface of the myoepithelial cells are designed to interact with a hormone, oxytocin, released during lactation. This interaction causes the myoepithelial cells—on the outer layer of the ductal structure—to contract, squeezing the luminal cells within. Those luminal cells are the breast’s milk factories. The research published today shows that BPTF is part of a regulatory system that opens chromatin and changes gene expression, specifically in mammary stem cells. This opening of the chromatin turns out to be critical in the ability of the stem cell to remain “immortal”—to give rise to daughter stem cells that will also help maintain a tissue such as the breast, and seeding it, at different times of life, with specialized cells. For example, during puberty, when the breast develops, or during pregnancy, when the breast gears up to produce milk.